A librarian has been recognised for her bravery in an incident where a man came into her building holding what looked like a handgun. Sandra MacLean, 63, who was working as a supervisor at the time, "calmly and discreetly" evacuated Fort William library of visitors and staff. After alerting police, she then went back into the building to make sure the man was still there. Ms MacLean left the library and locked it to make sure he could not escape. The man, who was 26, was jailed for 18 months in connection with the incident which happened on 25 May 25 2017. The gun was a replica. 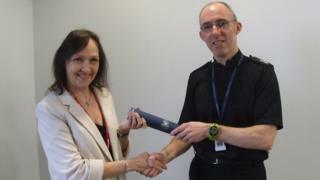 Ms MacLean, from Fort William, has been given a Police Public Bravery Award. She said: "In many ways I don't feel like I deserve an award but that in no diminishes my gratitude for it. "What I did at the time didn't feel especially brave, it simply the obvious thing to do to make sure the library was clear of people and that nobody else could get in. "Receiving the award put that whole day into perspective with the wider police investigation and I would certainly like to thank the officers for how they handled the situation when they arrived." Police Scotland's Highlands and Islands divisional commander Ch Supt George Macdonald praised the librarian's actions. He said: "Sandra's calm and professional response to an undeniably frightening situation helped ensure the immediate safety of the public and her staff. "Her initial actions also prevented the incident from escalating and allowed police to bring the situation to a swift conclusion on arrival without creating any wider risk to the public. "She deserves a lot of credit for her response and I was delighted to present her with this award to recognise the bravery of her actions."